To address the electronic waste problems in Contra Costa County, let All Green Electronics Recycling help you with ITAD Solutions, Data Destruction, and Equipment Destruction. To dispose of all your electronic disposables in Contra Costa County is the expertise of All Green Electronics Recycling. The presence of hazardous e-waste is dangerous to the environment. Thus, you should tap our IT Asset Disposition. The sensitive files and information contained in end-of-life hard drives and SSDs should be deleted for brand protection. Data breaches can cause problems against your business. Thus, all obsolete, defective and recalled items must be destroyed. The cities cited below are where All Green is able to serve through our Electronics Recycling Contra Costa County Services. The availability of our e-waste solution services in this county is a big help to the people here. Starting now, you can easily and conveniently recycle, reuse, and remarket your old IT equipment. This is a great opportunity for you right now. So grab our offers. Contra Costa County is located in the San Francisco Bay area in Northern California. According to the latest population survey, 1,049,025 residents are here living in 19 incorporated cities. Today, you can request a pickup from your home or business by following the link below. E-scrap recycling should be done in a simple and eco-friendly way. This is our commitment. We want to help people understand the value and importance of recycling through our proven solutions. Our IT Asset Disposition has been recognized not only in the U.S. but also in North America as one of the most trusted techniques to recycle EOL IT equipment. We are always compliant with the principles being “Reduce, Reuse, Recycle” policies and practices. We are always doing our best to help the environment sustain. That’s why we focus on providing services that can stop the irresponsible dumping of electronic waste in the landfills. We’re recognized as the nationwide leader in responsible recycling of all kinds of electronic trash. 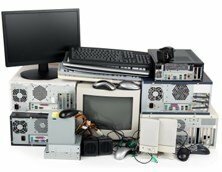 If you have old computers, mobile phones, stereo, cassettes, and other electric-run devices at home or office, let our recycling team visit your location to pick up such items. We’ll being those products to our world-class facilities in Southern California. We’re always passionate and committed to render helpful services for the betterment of Mother Earth and mankind. By disposing of your old computer units, like desktops and laptops, properly, you’re taking your first step towards the achievement of many benefits. One clear benefit is you can save money which can be used to reduce the cost of technology replacement. With All Green’s IT Asset Remarketing, you’re giving way for yourself to gain a maximum of 70% to be taken from the total resale net revenue. We will refurbish your disposable items to hit a higher resale price. The contained sensitive files and information in those disposable hard drives should be deleted permanently, in order to see to it that your business brand is well protected. Therefore, you need badly our data destruction and hard drive shredding. With this service, rest assured that you can have peace of mind. No data leaks will tend to happen. Your operation will continue to run smoothly. We have an extensive network of service field agents and recycling partners all over the country and even in North America. This has led us to become a recognized leader in the industry. We even have more trucks compared to other e-waste recyclers. So by choosing our Electronics Recycling Contra Costa County Services, disposing of old and unused electronics is easy and hassle-free. Contact us right now to know more information about our services.